job done right, the first time. We are the preferred brick paver and travertine sealing contractor of many Tampa Bay area custom home builders, paver contractors, condo and homeowner's associations throughout the Tampa Bay area. Our service area includes Lithia, Brandon, Lakeland, Wesley Chapel, New Tampa, Riverview, and Hillsborough, Polk, and Pasco counties. See our Service Areas page or give us a call at (813) 389-3683 to arrange a fast, free estimate. Seal 'n Lock paver sealing products were developed here in Tampa Bay and formulated for Florida's climate. Seal & Lock truly delivers the highest quality sealers in the business. We would not put our name and reputation on anything less than the best paver sealing product available to get your job done right. We have more experience that anyone with Seal n Lock Products and carry the Seal n Lock Sealing Pro Certification. Our free estimates include measuring the size of the job, evaluating the overall condition of the pavers, drainage, problem areas, and in some cases making recommendations for necessary repairs and preparation for your sealing project. You will receive a written estimate, and a plan for completing your sealing project that fits your schedule. When it's time to seal your pavers, we arrive promptly at the scheduled time, and treat each sealing job as if were our own. We pride ourselves on offering the highest quality products and service in the industry. We are a family owned and operated company, so there's never a "middle man" or sub-contractors working on your project. We only use the finest products available for your paver sealing project, including the industry leading Seal n Lock system. Our sealing process locks the sand into the joints. Prevents weed growth and paver damage from root systems. Paver Sealing Florida can clean and protect your concrete driveways, walkways, garages, and more with our concrete cleaning and sealing services. Helps protect against tire marking, stains, drips, and mold growth. Paver Sealing Florida is the preferred contractor of many Tampa Bay area communities, condo, and homeowner's associations to help keep thier communities beautiful. Call us at (813) 389-3683 to arrange a free written estimate. We only use the finest brick paver sealer available, Seal 'n Lock. The Seal 'n Lock brand has reshaped the paver sealing industry, and helps sealing professionals give better results in less time. The system is designed to give superior joint stabilization by flooding the sand joints with sealer and deep into the pores of the paver. 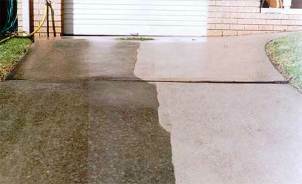 It gives long lasting protection of your brick pavers and other concrete surfaces. Call Us At (813) 389-3683 For A Free Estimate!